Uglyworld #588 - Stanley Cup Finals Time, originally uploaded by www.bazpics.com. 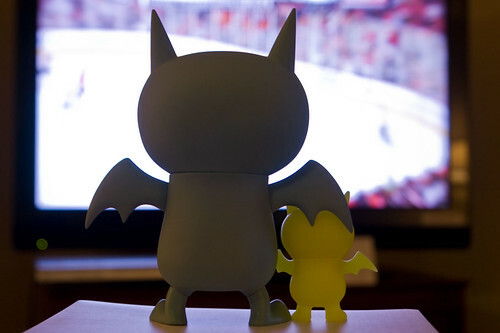 Little Ice-Bat has been so excited as his Chicago Blackhawks made the Stanley Cup Finals, so he drummed up some extra support to watch tonights game 2 with in the form of his big cousin. Half way through the 3rd and final period and the hawks are up 2 to 1, but Icy knows not to rule out the Flyers early as they certainly don't want to go down two games to zip.